This is a kind of fine quality electric bubble blowing toy, equipped with 12 holes that push out float bubbles which can capture your child&apos;s imagination. You can choose a sunny day, take your children to go out and have a picnic, and create colorful bubbles, enjoy your child-parent time. This product adopted ABS environmental protection material, and the bubble liquid won&apos;t hurt baby&apos;s delicate skin and safe for children. It brings children lots of fun, and moms rest assured. 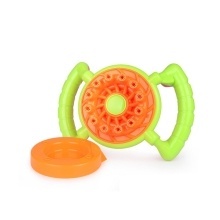 Equipped with 12 holes that push out float bubbles which can capture your child’s imagination. Innovative design, bubble richful and crystal clear makes this funny bubble blowing tool, also a fine gift for a birthday party, outdoors activities, perfect summertime. Open the tip of bubble machine kit, get a small fan for cooling, enough wind for your cooling in hot summer. Anti-slip handle design, not easy to fall down to the floor. And the fan blade is hided in the machine will not hurt the kids. With this product, let your children enjoy their funny colorful world. Note: powered by 4 AA battery, you should buy it by yourself.